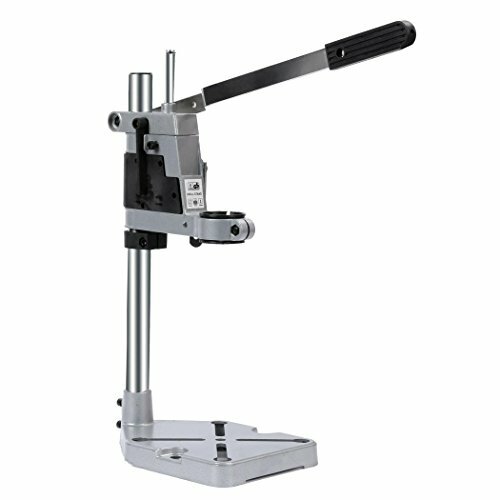 ADJUSTABLE HEIGHT: Allows you to center your project properly and lower your drill down straight, adjust range is 60cm. FEATURE: Scale with depth stop allows precised depth control and repeatability. STRUCTURE: It has a solid column bar and sturdy base with slots for fitting a machine vice. BASE: For Accurate Drilling of Workplace, Depth Markings with Depth Stop, for Consistent Depth, Sturdy Metal Base with 4 Clamping Points ,to Securely Hold the Station. Dimension: 20 x 14.5 x 39.5cm/7.8 x 5.7 x 15.4 inch (L x W x H), Base thickness: 2.2cm/0.9 inch, Drilling Collet Diameter: 42mm/1.6 inch.